Info A broadcast news veteran with a career that spanned more than 30 years, Frank Reynolds connected us to live news events that defined an era: space shuttle launches, national political conventions, an assassination attempt on a U.S. President. At the time of Reynolds death in 1983, he was the chief anchor of ABCs World News Tonight and was described by the president of ABC News as, "Representing journalism at its best. He reflected our highest achievements and expectations and served his profession with enormous integrity." Frank Reynolds was born in East Chicago, Indiana and attended high school in Hammond. A history major at Wabash College, Reynolds left his studies in 1942 to join the Army. He served in Europe during WWII, attaining the rank of Staff Sergeant and earning a Purple Heart before his discharge in 1945. Returning to the Midwest, he launched his career in news broadcasting at radio station WJOB in Hammond in 1946. His duties included both news announcing and sports casting. In 1963, he joined the ABC affiliate in Chicago, also called WBKB, where he was featured on "Frank Reynolds and the News." During the summer of 1964, he was a prominent member of ABCs political convention coverage team and served as the network's Midwest reporter for both the primary and general elections. In March of 1965, he became the only Chicago television reporter to travel to South Vietnam to report from the battlefront. That same year, he took a 50 percent pay cut to become an ABC network correspondent in Washington. Moderator of the presidential primary debate between Robert F. Kennedy and Eugene McCarthy in 1968 and a four-way Democratic presidential primary debate in 1972. 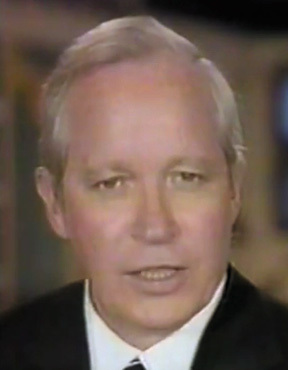 In 1978, he returned to the anchor chair, sharing duties with Peter Jennings and Max Robinson, which led him to characterize his career as "Lazarus-like." In 1979, he won the George Peabody Award for excellence in broadcast journalism, but humbly chose to describe his job in simple terms: "To help people understand what's going on."